Artist Wayson R. Jones will be joined in conversation with DCAC's 2018 Curatorial Apprentice Andy Johnson! Andy Johnson is a DC-based art historian, curator, and arts writer. He is Director of Gallery 102 at the Corcoran School of the Arts & Design; contributing editor at DIRT; and serves on the Curatorial & Sales team for Art on the Vine, hosted by the Agora Culture. Wayson R. Jones is a painter, musician, and spoken-word artist. He received a degree in music from University of Maryland and later went on to perform with renowned poet Essex Hemphill, as part of Washington DC’s burgeoning Black gay and lesbian arts scene of the 1980s and ‘90s. The two performed across the country, and appeared in works by groundbreaking filmmaker Isaac Julien (Looking for Langston) and videographer Marlon Riggs (Tongues Untied, Black Is/Black Ain’t). 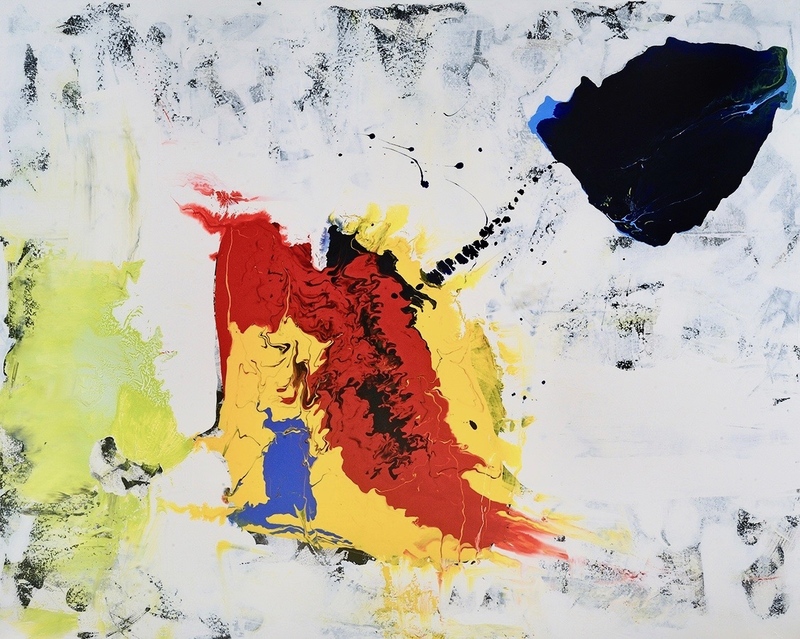 Wayson’s visual art is informed by these experiences and by an exuberant approach to materiality and process. He has had solo shows at BlackRock Center for the Arts, Arts/Harmony Hall, and the Northern Virginia Community College. His work has been purchased by the DCCAH, the Maryland/National Capitol Park and Planning Commission, MGM National Harbor, and is in private collections in the DC area and nationally. dcac’s nano gallery is located within the main gallery and is dedicated to presenting miniature and smaller works in an exhibition setting. Continuing the celebration of DCAC’s thirtieth anniversary, Then/Again remembers the “marathon opening” of DCAC on June 16, 1989. The Corcoran had cancelled the Mapplethorpe exhibition a week before, and there was a hope that this new venue would redress the grievances of a frustrated community of artists and provide a setting to show the diversity of artists working in the District. The idea struck a nerve and crowds waited in lines outside to experience the promise of the new organization. Then/Again includes contemporary work from nine of the sixteen artists from that first show, and recognizes how far both the artists and DCAC have come over the past thirty years. No Kings Collective, in partnership with Collection 14, presents UMBRELLA. Taking over an entire city block along the 14th St corridor, UMBRELLA will be a three day pop-up with multiple galleries, art installations, and site-specific projects. Activating the former Martha’s Table, Outfitters, and Smuckers Farms locations on 14th St, UMBRELLA will feature curation and art by Kelly Towles, Naturel, Maggie O’Neill, Monochrome Collective, Washington Project for the Arts (WPA), Mark Kelner, Fabiola Delgado, PAKKE, Rock Creek Social Club, District Dodger, and JAB. With art by Anne Marchand, Carlotta Hester, Dominique Fierro, Violetta Markelou, Ashley Williams, Emma Mcalary, Mary Cobb, Tina Lassiter, Lindsey Brittain, Christy Schlesinger, Meg Biram, Justine Swindell and many others. Stay tuned. Many thanks to friends, family, and art supporters who came out to hear the artist talk and celebrate with us during the reception. I hope you will return to bring your family, friends and art lovers to see the exhibition in this jewel of a museum nestled in Augusta, Georgia! I'll be returning soon! 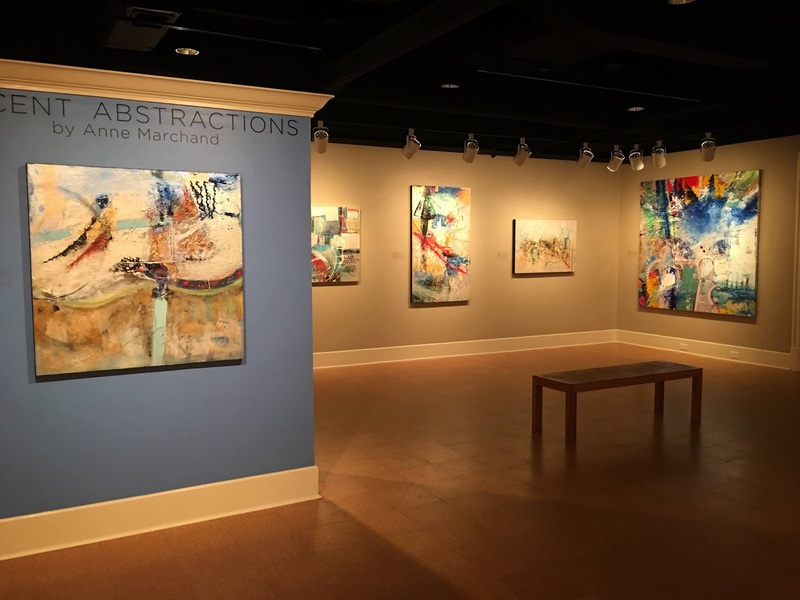 Recent Abstractions by Anne Marchand, opened to the public Saturday, January 26, 2019 at the Morris Museum of Art. The exhibition features twenty-five bold, colorful, large-scale abstract paintings by renowned artist Anne Marchand, remains on display through April 14, 2019. Born in New Orleans, Louisiana, Anne Marchand says that growing up in such a colorful environment, redolent with Spanish, French, and African influences left a lasting impression on her color sensibility. She traveled widely throughout the South, which had a similarly profound effect on her developing a visual vocabulary of form and color derived from nature. She earned a bachelor’s degree in art from Auburn University in 1971 and a master of fine arts degree from the University of Georgia in 1975. 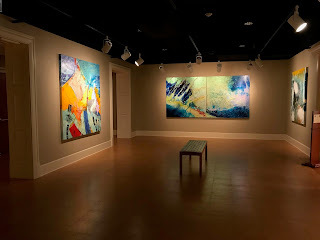 Since the mid-seventies, she has lived and worked in Washington D.C. She and her artist husband have traveled widely, experiencing the visual cultures of Europe, Central America, India, and Thailand. All have served as inspiration for her art. Her vibrant paintings are alive with shifting space, moving color, and animated lines. They reflect a range of perspectives: images of deep space, views from airplanes and automobiles, perceptions of natural and manmade textures and patterns, along with their emotional resonances, all distilled together. Her mature work is the result of years of experimentation, particularly with acrylic mediums and interference and pearlescent pigments. With these materials, qualities of radiance and light became active metaphors reflecting an inner state of being. Images of planets from the Hubble telescope inspired the painter to introduce circular imagery into her work. The nebulas and galaxies suggested biological structures, and Marchand realized the connection between space and the body as manifestations of the same universal energy. Her paintings capture a sense of wonder, introspection, and imagination. Marchand’s work has been recognized with many honors and awards. 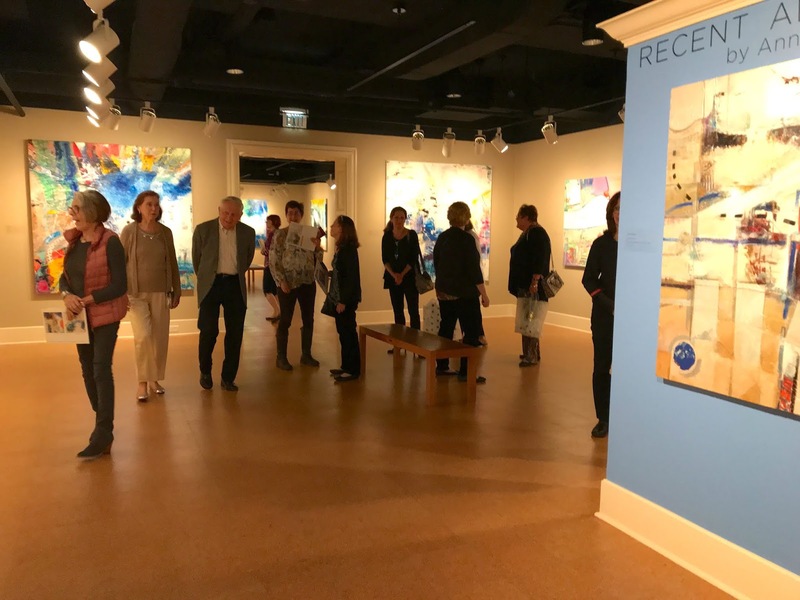 It is part of many corporate and private collections across the country, and has been exhibited widely in museums and galleries from New York to California. She teaches private classes and maintains a studio in Washington, D.C.
Museum admission: members, FREE; nonmembers, $5 per person. Exhibition continues through April 14. The Morris Museum of Art was founded in 1985 and opened to the public in 1992. It is the oldest museum in the country that is devoted to the art and artists of the American South. The museum’s permanent collection of five thousand works of art, dating from the late-eighteenth century to the present, represents every aspect of the region’s visual culture. The Morris is open to the public from Tuesday through Saturday, 10:00 a.m.– 5:00 p.m., and on Sunday, noon–5:00 p.m. For more information about the Morris Museum of Art, visit www.themorris.org or call 706-724-7501. 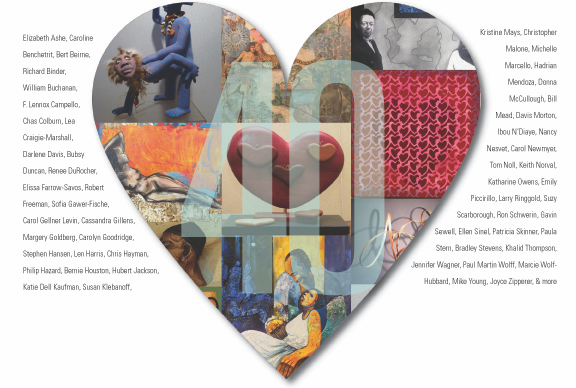 LOVE IN ALL MEDIUMS, our last in a series of anniversary exhibitions, concludes the commemoration of our 40th Anniversary year. Giving a nice twist to a lovely year for the gallery, yet a difficult one for humanity, we have put together a show about love, kindness, and the important things in life. 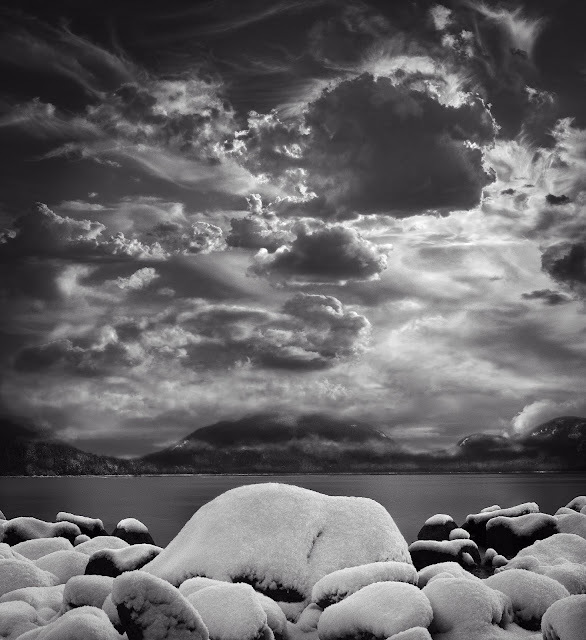 We will show new works by many of our gallery artists. La Maison Française at the French Embassy Hosts DC Debut of ‘Night of Ideas,’ Featuring Keynote Speaker Chimamanda Ngozi Adichie. Note: The Night of Ideas, originally scheduled at the Hirshhorn Museum, has been moved to La Maison Française due to the government shutdown. The Hirshhorn Museum and Sculpture Garden will partner with the French Embassy and the Judy and Peter Blum-Kovler Foundation to present the first Washington, D.C., edition of the Night of Ideas, a global marathon of ideas that will activate La Maison Française with talks and performances by today’s leading thinkers and creators, Thursday, Jan. 31, 2019, 6:30 p.m.–12 midnight. For one night only, guests will have the unique opportunity to hear from over 70 philosophers, sociologists, economists, musicians, artists and authors from the Washington, D.C., area and around the world. For its Washington debut, the Night of Ideas will explore the theme “Facing Our Time” through a diverse range of topics, including civil rights, digital privacy, art and advocacy, economics, feminist philosophy, art history and more. A keynote address will be delivered by renowned Nigerian author Chimamanda Ngozi Adichie, whose internationally acclaimed books, including Purple Hibiscus (2003), Half of a Yellow Sun (2006), Americanah (2013), We Should All Be Feminists (2014) and most recently, Dear Ijeawele, or a Feminist Manifesto in Fifteen Suggestions (2017), have been credited for starting a worldwide conversation about feminism. Participants will enjoy thought-provoking insights from luminaries including art critic, curator and Marcel Duchamp expert Bernard Marcadé; French philosopher Manon Garcia; artificial intelligence specialist Eric Gaussier; Senegalese economist and writer Felwine Sarr; author and national correspondent for The Atlantic Franklin Foer; privacy and public policy expert Dipayan Ghosh; the George Washington University Debate & Literary Society; and Smithsonian Year of Music co-curator Huib Schippers. Dynamic performances from French visual artist Frédéric Nauczyciel and American voguing performer Marquis Revlon’s Marching Band Baltimore Project will punctuate the beginning and end of the event. The night will also include an interactive poetry performance by Les Souffleurs commandos poétiques, an instrumental interpretation of paintings into music by violinist David Schulman and a spoken word presentation by poet Charity Blackwell. Guests will also enjoy pop-up art activations and in-gallery DJ performances throughout the night. This presentation of the Night of Ideas will also feature: Raphaël Liogier (philosopher and sociologist), Fabien Truong (sociologist), Anastasia Colosimo (political scientist), David Levaï (environment expert), Jessica Mehta (poet), Ada Pinkston (artist) and Halcyon Arts Lab fellows Kristin Adair, Kelli Rae Adams, Jessica Mehta, Tariq O’Meally, Ada Pinkston, Althea Rao and Naoko Wowsugi. The event is free and open to the public. *Registration required. While all tickets for the event have been reserved, we encourage everyone to join the waitlist, which can be accessed at www.nightofideasdc.com. Food and refreshments will be available for purchase throughout the evening thanks to Le Café Descartes. A full list of activities can be found at https://www.nightofideasdc.com. Wishing you a Joyous Holiday and a New Year filled with Peace and Happiness. 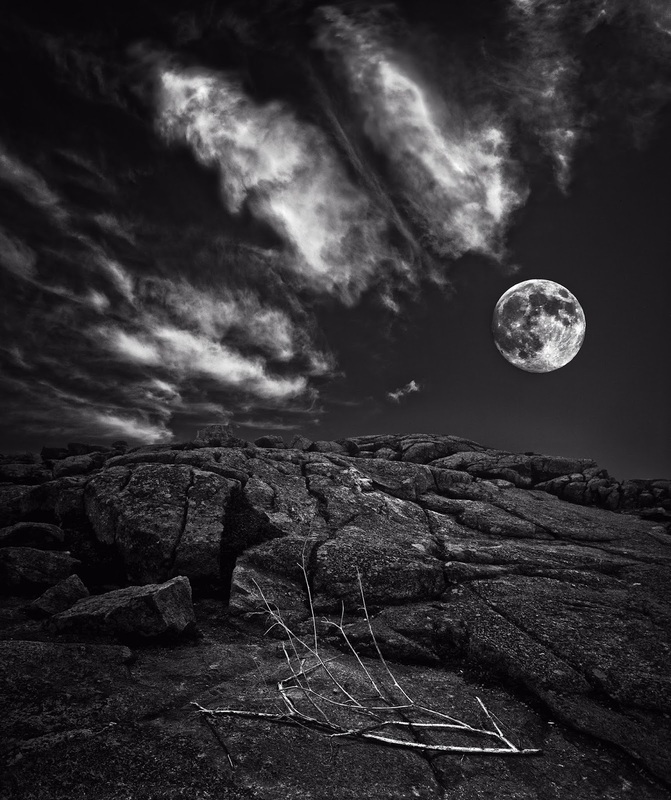 Image: Anne Marchand. Refuge. 2018. 48 x 60 in. Copyright © 2018 Anne Marchand Art, All rights reserved.